The Napa Valley has many fine small and boutique wineries. These are our selection of boutique Napa Valley wineries on Highway 29. You will want to keep a watchful eye as you travel along Highway 29, as the entrances to these wineries will come up quickly. A good driving tip is to visit the wineries on the right side of the road as you driving either north or south. Highway 29 traffic is busy and left turns can be difficult. We recommend you only visit three wineries in one day. Pace yourself and enjoy the serenity of the Napa Valley. Before you head to the Napa Valley, be sure to consult our Napa Valley Wine Country Planning Guide. • Peju Province Winery –Has a food pairing selection on the tasting list. This tasting room has a very inviting atmosphere. You can easily tell that these folks love their wines and want everyone to know and enjoy them. The wines are estate grown in the Oakville AVA. The Cab and Chardonnay are excellent. Turnbull is one of the few wineries in the Napa Valley making a Syrah. It is delightful. Another great bargain is the Old Bull Red. Turnbull is located a half mile north from the Oakville Crossroad, across the road from the Robert Mondavi Winery. After Turnbull watch quickly and closely for the entrance to the Sequoia Grove winery on Highway 29 on the right. The winery sits on a beautiful plot of land surrounded by tall majestic Coast Redwoods. 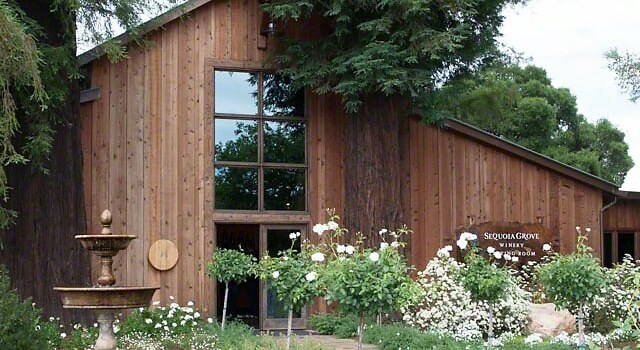 You can taste or purchase wines by the glass at Sequoia Grove Vineyards. We very much like the very deep and delicious Cabernet Sauvignon. One refreshing wine not to miss it the Gewürztraminer, if it is available. It is sold only at the tasting room and sells out quickly. This is a small family owned winery making exceptional wines. Peju produces 12,000 cases of wine per year and it’s unlikely you will find the wines for sale any other place but the winery. The wines are distributed to many high-end restaurants or purchased by a long list of steady customers who can’t seem to wait to purchase the latest releases. Among their wines, the Cabs and Chardonnays are outstanding. One interesting wine that we liked was the Peju Province. It’s a Rhone-style red wine served chilled. Peju is the next winery after St. Supery as you travel north on Highway 29. If you pass Rutherford Rd. you have missed Peju. Turn back! Grgich Hills Winery is one of the most respected wineries in the Napa Valley. Much of that has to do with the legendary Mike Grgich. His fame began in 1976 as winemaker at Chateau Montelena. The Montelena Chardonnay was a surprise winner of the famous Paris blind tasting event of 1976. The event featured Napa Chardonnays against the world-renowned French White Burgundies. Shortly after this historic wine event, Mike left Montelena and co-founded the Grgich Hills Winery. More than 25 years later, and into his 80’s, Mike Grgich still manages the operations and winemaking at Grgich Hills. All of the six Grgich Hill wines are excellent and the Cabernet is exceptional. This is one of the most popular wineries on Highway 29. Even this winery is right on Highway 29 just north of Zinfandel Lane, most travelers miss this winery because the beautiful green barn is set back from the roadway. It is very easy to miss. Cathy Corison is one of Napa Valley’s first women winemakers and is well recognized by her colleagues as one of the more influential winemakers in the entire Valley. Her Corison Cabernet wines have long been noted for their quality and character. Merryvale is a winery producing excellent wines with a variety of offerings. Merryvale consistently receives recognition for its wines. The setting is very elegant and the tasting room very cordial. It’s a fun tasting room to visit with lots of interesting items to view and purchase. You must get a look at the elegant Cask Room. The Cask Room is a spectacular setting for social events, with a very long table running the length of the room. The walls on both sides of the table are lined by large casks of wine. The room is available for rental. The winery is located in St. Helena, next to Tra Vigne restaurant. Ehlers Estate Winery is a beautiful winery in the northern portion of St. Helena. Elhers is certified organic and in addition practices Biodynamic farming methods. The winery was originally established in 1886 by Bernard Ehlers and today the tasting room is housed in the original winery. From the tasting room entrance, one can view the estate vineyards. It is quite a beautiful scene. One more thing: Ehlers is a non-profit winery. The present owners, Jean and Sylviane Leducq, have set up a foundation to combat cardiovascular disease. The wine profits go directly to the foundation. The Ehler wines are excellent. You are encouraged to have a designated driver. Consider hiring a limousine or van service. First time to a winery in Napa? Find out what happens in a typical tasting room. Most wineries in the Napa Valley charge a tasting fee. Expect to pay $10 or more to taste. Two people can always elect to share a tasting. Some ideas for which wineries to visit. Plan a picnic lunch. This is one of wine country’s greatest pleasures. If you cannot picnic, enjoy a delicious lunch at one of Napa Valley’s many fine restaurants. We list premium lodging and budget lodging. Pace yourself and make a day of wine tasting. Don’t forget your camera. Visiting three wineries in one day is enough to you keep you busy and content with the slow and easy pace of wine country. Please read our Disclaimer Document on the information contained on Wine Country Getaways.